France midfielder Yohan Cabaye has warned his side against arrogance in Monday's second round match against Nigeria. Les Bleus qualified for the knockout stage unbeaten with two wins as they aim to reach a World Cup quarter-final for the first time since 2006. "It's great to be ambitious. But to say we're going to win the World Cup is a lot," said Cabaye, 28. "Confidence shouldn't become arrogance because that's when you have problems." 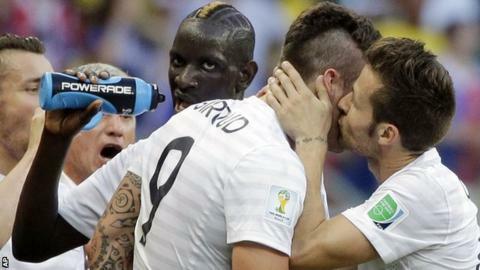 Cabaye's team-mate Bacary Sagna has been reported as saying it would be a "failure" if France did not win the World Cup. Les Blues have lost two of their last three World Cup matches against African nations (2002 v Senegal and 2010 v South Africa). They beat Togo in 2006. All of France's goals during this World Cup have come from inside the box. France attempted more shots at goal (50; excluding those blocked) than any other side during the 2014 World Cup group stages. Karim Benzema has scored nine goals in his last nine appearances for France, including three goals in his three appearances at this World Cup. Nigeria reached the last 16 for the first time since 1998 with one win and a draw from their Group F games and start the tie in Brasilia as underdogs. But Paris St-Germain's Cabaye, who returns to the France squad having been suspended for Wednesday's goalless draw with Ecuador, insists the African champions cannot be taken lightly. "One false step and you're home, so you already have that pressure," the former Newcastle player said. "I respect this Nigeria team and we can go through but to say we can win the World Cup... well you have to be careful. "Even with the mentality and determination we have on the pitch, there's nothing to say we won't be beaten by a better side. Going from having ambition to saying we have to win the World Cup is putting yourself under unnecessary pressure."